On this report the heads of the families are g-g-uncles and aunts, except the last head, William Elijah Joseph Petty and Frances Viola are my grandparents. Although they have been dead a long time it doesn't mean they "were" my grandparents. They always will be my grandparents. Also, on this report if a person does not reproduce the last entry you will see is as children. On the other hand, if they do reproduce they appear again, on down the line as the head of the households. I mentioned this because the two oldest of my grandparents kids, Georgia and Tom did not reproduce. So, this was the last chance to show some of their pictures in this continuation report. 230. ELIJAH W.8 PETTY (WILLIAM D.7, ELIJAH6, ZACHARIAH5, WILLIAM4, THOMAS3, THOMAS2, HUBERT1 PATEY) was born 14 Sep 1858, and died 13 May 1927 in Dalton, Whitfield, Ga. He married (1) ANNIE E. UNKNOWN. She was born 07 Oct 1872, and died 18 Jan 1927. He married (2) ELIZA "LIZZIE" LACKEY in , Murray, Ga. She was born 03 Apr 1858, and died 30 Aug 1899. I was prowling thru a box of pictures, just in case there was any old Petty pictures. In this old box is a very old photograph....black and white.......that has written on the back.......Annie E. Petty and Elijah W.Petty. Neither of them are smiling. Annie Eliza's hair is dark, pulled up into a bun. Her dress has a high necked collar on it. Elijah has dark hair too. He has a rather large mustache that covered his upper-lip. He has on his Sunday-go-to-meetin suit. In the book MURRAY COUNTRY GEORGIA MARRIAGE RECORDS BOOK I-VI 1835-1905, page 63, Book VI-372 Elijah and Eliza are listed as marrying 24 Dec 1899, which is several months after when I have listed her as dying. The next time I am in Murray County, I wil check this out. - E.T. Hunter. i. LEE9 PETTY, b. Abt. 1893; d. Unknown. ii. EDWARD HARLAN9 PETTY, b. 12 Mar 1910, Dalton, Whitfield, Ga.
231. J. N.8 PETTY (WILLIAM D.7, ELIJAH6, ZACHARIAH5, WILLIAM4, THOMAS3, THOMAS2, HUBERT1 PATEY) was born Abt. 1862, and died 10 Oct 1915 in , Murray, Ga. He married M.C.. She was born 19 Feb 1866, and died 31 Jul 1953 in , Murray, Ga.
i. ETHEL L.9 PETTY, b. 08 Sep 1888; d. 22 Oct 1910.
ii. JIM PETTY, b. Bef. 1900; d. Unknown. 232. GEORGIA E.8 PETTY (WILLIAM D.7, ELIJAH6, ZACHARIAH5, WILLIAM4, THOMAS3, THOMAS2, HUBERT1 PATEY) was born 1875, and died 1901. She married JOHN H. KING 25 Dec 1891 in , Murray, Ga101. He was born Abt. 1875, and died Unknown. i. WILLIE9 KING, b. 08 Nov 1895; d. 04 Nov 1912. Lived: 4 days short of 17 years. ii. RUTH KING, b. Aft. 1895; d. Unknown; m. A EDMONDSON; b. Abt. 1895; d. Unknown. iii. RAY P. KING, b. Sep 1900; d. 23 Jul 1901. 233. UNKNOWN18 PETTY (WILLIAM D.7, ELIJAH6, ZACHARIAH5, WILLIAM4, THOMAS3, THOMAS2, HUBERT1 PATEY) was born Abt. 1876, and died Unknown. She married A JAMES. He was born Abt. 1875, and died Unknown. i. A. J.9 JAMES, b. Aft. 1895; d. Unknown. 234. UNKNOWN28 PETTY (WILLIAM D.7, ELIJAH6, ZACHARIAH5, WILLIAM4, THOMAS3, THOMAS2, HUBERT1 PATEY) was born Aft. 1877, and died Unknown. She married A GEORGE. He was born Aft. 1877, and died Unknown. i. HENRY9 GEORGE, b. Aft. 1897. 235. JOHN E.8 PETTY (ELIAS L.7, ELIJAH6, ZACHARIAH5, WILLIAM4, THOMAS3, THOMAS2, HUBERT1 PATEY)102 was born 04 Nov 1865 in , , Ga, and died Unknown. He married LUCY JANE THOMPSON103 15 Apr 1894 in , Hamilton Co, Tx103. She was born Dec 1861 in , , Tx, and died Unknown. i. ROSA L.9 PETTY103, b. Feb 1897; d. Unknown. ii. WILHELMINA CATHERINE PETTY103, b. 23 Dec 1900; d. 27 May 1979; m. CHARLES RICHARD EDGAR103. 236. WILLIAM D.8 PETTY (ELIAS L.7, ELIJAH6, ZACHARIAH5, WILLIAM4, THOMAS3, THOMAS2, HUBERT1 PATEY)104 was born Jul 1874 in , , Ga, and died Unknown. He married (1) ANNIE CARINEAN105 15 Apr 1901 in , Hamilton Co, Tx. He married (2) STELLA WILY106 22 May 1911 in , Hamilton Co, Tx. i. CHRISTINA9 PETTY107, b. Abt. 1913; d. Unknown. ii. AURELIA PETTY107, b. Abt. 1916; d. Unknown. iii. MARY N. PETTY107, b. Abt. 1917; d. Unknown. 237. ALICE SAPHRONIA8 MURRAY (NANCY C.7 PETTY, ELIJAH6, ZACHARIAH5, WILLIAM4, THOMAS3, THOMAS2, HUBERT1 PATEY) was born 28 Sep 1872 in , Fannin, Ga, and died 22 Aug 1944 in Crandall, Murray, Ga. She married STEPHEN THOMAS PRITCHETT, son of DAVID PRITCHETT and ELIZABETH PANKEY. 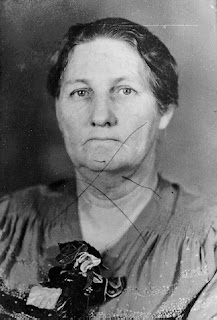 He was born 21 Jan 1871 in , Davis, Ka, and died 23 Jul 1939 in Crandall, Murray, Ga.
i. LOLA MAE9 PRITCHETT108, b. 30 Jul 1895, Crandall, Murray, Ga; d. 06 Jun 1993, Chatsworth, Murray, Ga; m. OSCAR HOLCOMB, 30 Sep 1922, , Murray, Ga; b. Aft. 1895; d. Unknown. 312. ii. WILLY LEE PRITCHETT, b. 20 Nov 1896, Crandall, Murray, Ga; d. 23 Jul 1939, Crandall, Murray, Ga.
iii. LUTHER DAVID PRITCHETT, b. 06 Jan 1899, Crandall, Murray, Ga; d. 17 May 1972, , Murray, Ga; m. LENA JANE PEDEN108, 16 Apr 1923, , Murray, Ga; b. 11 Nov 1904; d. 05 Apr 2000.
iv. CLAUD THOMAS PRITCHETT, b. 09 Nov 1900, Crandall, Murray, Ga; d. 16 Oct 1978, Cleveland, Bradley, Tn; m. EDITH DUNN, 27 Aug 1927, Cleveland, Bradley Co, Tn; b. Abt. 1900; d. Unknown. v. ARVIL HENRY PRITCHETT, b. 30 Oct 1902, Crandall, Murray, Ga; d. 07 Feb 1941, , Murray, Ga; m. SUDIE HEADRICK, 12 Aug 1929, , Murray, Ga; b. Abt. 1902.
vi. MARY LIZZIE DOVE PRITCHETT, b. 19 Oct 1904, Crandall, Murray, Ga; d. 18 Mar 2000, Chatsworth, Murray, Ga; m. NOAH SAMUEL CARTER, 16 Apr 1922, Crandall, Murray, Ga; b. Abt. 1904.
vii. JOHN ERNEST PRITCHETT, b. 26 Nov 1906; d. 24 Dec 1990, , Murray, Ga.
viii. JAMES WALTER ROBERT PRITCHETT, b. 10 Jan 1910; d. 12 Dec 1984, , Murray, Ga; m. LEONA HEADRICK; b. Abt. 1910. 238. SARAH LUCY8 MURRAY (NANCY C.7 PETTY, ELIJAH6, ZACHARIAH5, WILLIAM4, THOMAS3, THOMAS2, HUBERT1 PATEY) was born 1867, and died 1897. She married ANDREW GREENVILLE PULLEN 08 Dec 1887 in , Murray, Ga, son of GREENVILLE PULLEN and ELIZABETH BOOKOUT. He was born 15 May 1862 in , Murray, Ga, and died 13 Feb 1936 in , Murray, Ga.
i. JOHN WILLIAM9 PULLEN, b. 19 Sep 1888, , Murray, Ga; d. 28 Jan 1966, , Murray, Ga. He was only nine years old when his mother died. He never married. ii. JAMES TAYLOR 'JIM' PULLEN, b. 30 Apr 1889, , Murray, Ga; d. 23 Sep 1918. Eight years old when his mother died. 313. iii. CLARA GEORGIA G. PULLEN, b. 29 Jun 1892, , Murray, Ga; d. 04 Jul 1970, , Murray, Ga.
314. iv. CHARLEY CLIFFORD PULLEN, b. 10 Jan 1896, , Murray, Ga; d. 18 Dec 1973, Fletcher, , Ok.
239. WILLIAM ELIJAH JOSEPH8 PETTY (DANIEL WEBSTER7, ELIJAH6, ZACHARIAH5, WILLIAM4, THOMAS3, THOMAS2, HUBERT1 PATEY) was born 01 Jan 1875 in , Fanning, Ga, and died 11 Nov 1935 in , Whitfield, Ga. He married FRANCES VIOLA RIDLEY 02 Dec 1904 in , Murray, Ga, daughter of THOMAS RIDLEY and MARYETTA PULLEN. She was born 29 Sep 1885 in . Murray, Ga, and died 21 Jul 1968 in Dallas, Paulding, Ga.
i. GEORGIANNE9 PETTY, b. 11 Dec 1906, , Murray, Ga; d. 30 Oct 1966, Chattanooga, , Tn; m. CECIL GRANT; b. 19 Nov 1901; d. 04 Nov 1958, Chattanooga, , Tenn.
Small and frail - spoke in a horse voice. Cecil played the banjo and another string instrument-. He also was a movie collector. He had a little building in the back yard that he had a movie projector and a huge collection of western movies. Hoppalong Cassidy, Tom Mix, Lash LaRue, The Durango Kid, and more. In the fall in Atlanta had the Southeastern Fair at the Lakewood Fairgrounds. Every year at that time, the Grants would come down from Chattanooga and stay a couple of days. Georgia would stay in Marietta to visit siblings and Cecil would go to the Southeastern Fair alone. Georgia and Cecil both were very short people. And drove a small car for the times - a Crosby. Cecil was bald headed. Once (during Southeastern Fair season), when they were visiting, I was about four years old, I asked Cecil could I spin my top on his head. On 4 November 1958, Cecil was on top of his wooden building in the back of the house making repairs to the roof. He had a metal hammer. The nail he hit an electrical wire, and in turn, electrocuted Cecil. He died fifteen days before his fifty-seventh birthday. Cause of Death: Electricuted when hitting a live wire with a metal hammer on his movie out bldg. ii. THOMAS JEFFERSON PETTY, b. 03 Oct 1908, , Murray, Ga; d. 24 Dec 1979, Chattanooga, , Tenn; m. MARY JO JOHNS, 12 Nov 1932; b. 08 Sep 1913, , Gordan, Ga; d. Feb 2000, , Gordon, Ga.
315. iii. WALLACE CHARLES PETTY, b. 09 Sep 1910, , Murray, Ga; d. 20 Jun 2007, Millegeville, Baldwin Co , Ga.
316. iv. OPAL RUBY PETTY, b. 12 Apr 1913, , Murray, Ga; d. 19 Jul 1992, Marietta, Cobb, Ga.
317. v. OSMO CALVERT PETTY, b. 15 Jul 1915, , Murray, Ga; d. 18 Feb 1978, , , Ind. vi. COSMO PETTY, b. 15 Jul 1915; d. 15 Jul 1915. 318. vii. ETHEL AMERICA "JANIE" PETTY, b. 06 Jun 1918, Gillette, Campbell, Wyo; d. 24 Feb 1996, Marietta, Cobb, Ga.
319. viii. WILLIAM LEROY "ROY" PETTY, b. 22 May 1921, , Appomattox, Va; d. 21 Mar 2000, Carmel, , NY. 320. ix. LEONARD FRANCIS PETTY, b. 14 Feb 1924; d. 13 Apr 2001. 321. x. SARAH PETTY, b. 21 Feb 1927, , Whitfield, Ga; d. 09 May 1999, Atlanta, Fulton, Ga (@ nursing home)..
Art for Art's Sake.. Arf Arf!! Lookie!! Here Is the Good Old Boy Article! Us Good Old Boys Made the Paper! !